Red Classic — a subsidiary of the largest independent Coca-Cola bottler in the United States — has seen very strong growth across its divisions, and Mack Trucks is helping the company meet the equipment and logistics challenges that come with such rapid expansion. Prior to 2011, Red Classic was the in-house transportation arm of Charlotte, N.C.-based Coca-Cola Consolidated. When the parent firm spun Red Classic into a separate entity, the door opened for impressive market ­advancement. Since Red Classic was established, its transportation services have seen very strong growth, and the company launched two new divisions: a brokerage segment that has grown fourfold since it was founded and an outside maintenance segment — derived from its former, internal-only maintenance operations — with triple-digit growth. The maintenance division services light-duty vehicles to material-handling equipment to class 7 and 8 tractors, and offers tractor and trailer bodywork for “everything from touch-up painting to full accident reconstruction,” Smith says. To keep an older fleet on the road, Coca-Cola Consolidated had performed its own maintenance and even completely refurbished many of the trucks. Red Classic bought its first Mack® truck in 2012 and now buys more than 100 trucks per year, primarily Mack Pinnacle™ day cabs with tandem axles, MP7 engines and the mDRIVE™ automated manual transmission. “I can’t express how much it means to be a business partner with a company with such strong moral character,” Locke says. 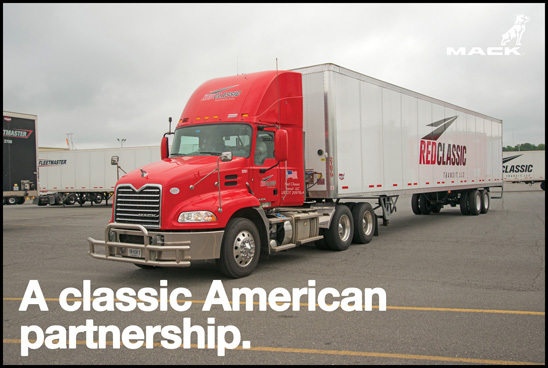 Red Classic is expanding out of its Southeast footprint into the Midwest, and has approximately 445 trucks, 87 locations, 613 drivers and 262 technicians. The company’s fleet, of which 69 percent are Mack trucks, typically hauls pallet loads in a mix of city and highway conditions. For its parent company, Coca-Cola Consolidated, it hauls preformed bottles, cans and ingredients to production centers, then carries finished products to distribution and sales points. Red Classic, like most trucking companies, feels the struggle to recruit and retain drivers but says operating Mack trucks gives them a competitive advantage. The uptime Red Classic achieves comes from using Mack services such as the GuardDog® Connect telematics network, Mack OneCall™ and the ASIST system and is key to the company’s success, Smith says. GuardDog Connect helps the company to anticipate vehicle service needs, which in turn allows drivers to focus on the task at hand, says Eric Turner, external invoice processor/service writer for Red Classic. “Drivers already have a lot of responsibility and this technology helps us monitor vehicle condition without adding to drivers’ workload,” he says. Through Mack’s Uptime Solutions, trucks are diagnosed and repaired quickly. Red Classic receives updates throughout the process. “We can track everything that’s going on from the time the truck hits the door until we get it back,” Smith says. “It makes sure our trucks are on the road and running as much as possible. It helps us out a lot that Mack is doing the legwork versus us having to stop what we’re doing and call around to dealerships we might not be familiar with. That’s support I’ve not seen from any other OEMs."